*Your family; too busy to spread any dwindling Holiday cheer you may have remaining. At some point just before the Holidays, I come home to Teen Boy’s favorite Christmas activity – picking out livestock. Yes, you read that correctly. For about six years, we’ve purchased sheep, rabbits, trees, and pigs through the incredible organization Heifer.org. The basic premise is this – your donation funds the shipment of livestock to a family or village. You can “pick out” the critters on the site. Rather than sending food, the livestock provides the opportunity for continual benefit. Betcha didn’t know a goat can produce almost a ton of milk in a year. A flock of chicks is only $20; honeybees are $30; rabbits for $60. 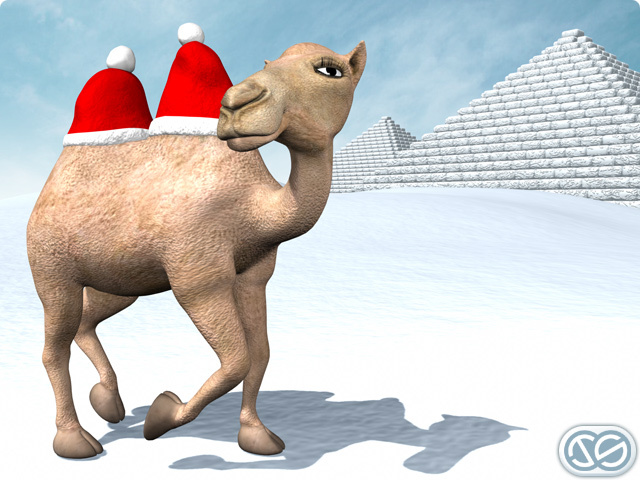 Gifts range all the way up to the $850 camel – how cool is a camel! I started this because we had cousins on my former-husband’s side who were impossible to shop for. By the age of ten, they owned every toy imaginable, and viewed their letter to Santa as an Order Form. I couldn’t believe my good fortune when a co-worker told me about this website! My Ex thought it to be a terrible idea, which only sealed my determination. After giving it some thought, I would have to categorize myself as Holiday Bi-polar. How magical is having the opportunity to focus on family, food, entertaining, decorating…… and then the commercials start. And Black Friday. What’s with that? And I want to know WHO is responsible for the whole idiocy of Santa. Want to give your kids gifts? Great. But don’t send out the message that all good kids get stuff from a fat man with flying deer. Millions of great kids don’t. The choice has been taken from parents; unless you want your kids to be the only ones to return from vacation feeling like they live in a Charles Dickens novel in comparison to their classmates. Oh, I was in the middle of a heart-warming Christmas tale. Sorry! So I printed out a card from the site, and wrapped it with a nice box of candy and treats for them to open (I know kids like to open something). Much to everyone’s surprise, all the cousins dropped everything & scurried over to the computer to look up the organization. They were so excited to be sending a goat! If I were going to add a sentimental thought such as “Not only is it a great gift to those receiving; but it is truly a gift for your children” this is where it would be. For us, it’s become more of a tradition than a “gift”. Local animal shelters are also a favorite, our extended family is full of adopted pets. It is possible to help out no matter how little time/resources you have. Since that first year, my son has initiated the donation on his own, and it warms my heart like nothing else. I always buy my Christmas cards from the SPCA – everybody loves them. My mom and I are going out to “adopt” a kitty for her this morning. Happy holidays! That is so sweet, a great gift for your mom & the lucky kitty! Excellent post! I gave the gift of a goat through Heifer yesterday and wrote a short blog about it hoping to spread the word. I only learned of Heifer through another blogger earlier this month, but yesterday’s gift was the beginning of a tradition for me. Thanks Tony, I really appreciate this. I was so caught up in the drama and the baking and the tinsel I wasn’t focusing on what was important…a gaggle of geese. This has been a nice gift for me, I’ll tell you that! A fun read is always a treat.